. : a history [of violence]:. -- Have you heard the new Gojira track? Taken from the new EP they'll be releasing to benefit Sea Shepherd Conservation Society comes a new track titled "Of Blood And Salt" featuring Fredrik Thordendal (Meshuggah) and Devin Townsend. We've been hearing about this "never-to-be-repeated" performance for quite some time. It finally took place in Oslo's Spektrum on Saturday May 28th. Here's a fully orchestrated live version of "Progenies of the Great Apocalypse" from that night. For more footage from the concert click here. -- Finntroll's Nifelvind is coming! -- Ladies & Gentlemen here comes The Kandidate! The Kandidate's Napalm Records debut "Until We Are Outnumbered" will be out soon. The band, fronted by ex-Hatesphere singer Jacob Bredahl, have just put online a video for the song Give Up All Hope. For more tunes and info about these rocking(and rolling for sure) death metallers click here. Finally a brand new edition of 5 Q&A interview series. [of violence] sincerely hopes you would enjoy this one. Hungarian duo is back in 'action' after their quite long hiatus. 1 Let's start with the 7 year hiatus and getting back together. What were the reasons to give that kind of a break? And what you guys missed most in that period of time? - The main reason was that I finished a long relationship and I wanted to change my life. I got a job opportunity in London, so I made the move and left Hungary. I was going to stay for a year, maximum, but at the end it turned out to be 7 long years. Meanwhile, Yzokras was focusing on his studies, got diplomas in Hungarian and German languages and literature. Well, I think what we missed the most was the lost oppurtunity of creation, but on the other hand we got time for developing our style and the band became more sophisticated. So, basicly after I came back we immediately started to work on de profundis, again. We were full of ideas, I managed to put together a small home studio, so there was nothing in the world at this time that could have stopped us. -- Bonecrushing heaviness from Speedblow! 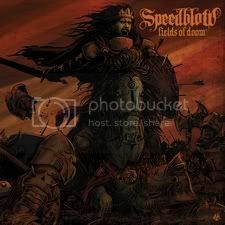 Black souled metallers Speedblow are about the release their first full length album via Trailblazer Records. They've just uploaded two brand new tracks, Blood of The Innocent and Silence Is Breaking at their Myspace page. By the way the breathtaking cover artwork for the album was done by none other than Vance Kelly. Norwegian Industrially gothic metallers have just made their new video 'Freak' available for your viewing pleasures. --Shai Hulud's European Tour Dates! They'll be hitting to European shores once again in February/March 2010.
click here for more up to date info on tour & the band. -- Meshuggah's live CD+DVD on the way! -- Pentagramnation on the Rise! On October 13, LA's thrashy death metallers Rise has released their 4th record. Here's the video for the title track of the album, Pentagramnation!